Chermoula is a garlicky spice paste of North African origin, which usually includes cumin, paprika and chilli. It's often used with fish, but works beautifully when paired with the earthiness of roasted vegetables. In a large ovenproof tray, toss the vegetables and the whole garlic cloves in the oil. Season. Roast for 25-30 minutes, stirring once or twice so they brown evenly without burning. Keep warm in the oven. Meanwhile, heat the olive oil for the pilaf in a large, deep frying pan over a medium heat. Fry the onion till very well browned and caramelised (this will take 20-25 minutes), stirring regularly and adding the cumin seeds and ground cumin about halfway through the cooking time. While the onion is cooking, bring a small pan of salted water to the boil and blanch the broad beans for 5 minutes. Refresh under cold water and slip off the skins. 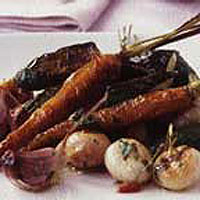 You can also make the chermoula while the onion and vegetables cook: simply mix all the ingredients together in a bowl. Add the garlic to the caramelised onion and cumin mixture. Add the rice and stir over a medium heat until it's well coated in the golden onion and oil. Cover with the cold water and stir in the bouillon powder. Cover and bring to the boil. Immediately reduce to a gentle heat and simmer for 20 minutes or until all the liquid is absorbed. Remove the lid, stir in the broad beans, the raisins and the saffron water. Raise the heat and stir carefully for another 6-7 minutes so that the rice goes a lovely, warm gold and the sweet and pungent flavours are fully developed. Stir through the chopped parsley and coriander and the toasted almonds and season. Take the vegetables out of the oven and toss in the chermoula. Serve the hot rice at once with the roasted, spicy vegetables and garlic in a dish by the side.